With the fall air drawing near, this is a time for drivers to take note of what gear they are storing in their vehicles. The seasons of fall and winter bring icy roads, colder weather, and various less than ideal driving conditions. Safety should always come first when it comes to hitting the road. We have compiled a list of ways that drivers can help keep themselves and others safer this fall and winter season. The weather changes can have an effect on any driver's car. There are some maintenance checks that travelers can do before they start their engines. Get your vehicle serviced — Pennsylvania requires all cars to pass safety inspections to ensure they are maintained for safe operation. In addition to staying up-to-date on safety inspections, drivers should consider a quick service at their local mechanic at the onset of winter to be sure all equipment: your battery, tires, exhaust, heater, and defrost, are functioning properly. Have a charged phone — In the case of an accident — or if a driver gets stuck or stranded — make sure you can summon help. It’s always a good idea to keep a phone charger in your vehicle — just in case. Blankets — If a car is stuck in a snow drifts or broken down on a crisp fall or winter evening, blankets are a must-have for keeping the driver and passengers warm as they wait for help to arrive. 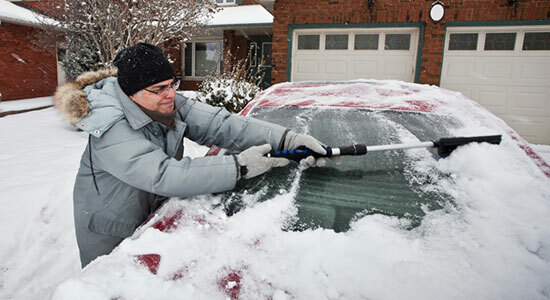 Ice scraper — Before driving, all ice should be scraped from the windows of a car. An ice scraper can help make the job easier and improve driving visibility. Don't be a peephole driver. Extra warm clothes and gloves — Along with the blankets, it's useful to have some extra warm clothing in the car if the driver or passengers need to leave the vehicle to seek help in the cold. Dried food and water — In a scenario where a driver could be stranded for a few hours, having dried food and water can be a life saver. Some food items could include: energy bars, dehydrated food packs, trail mix, and beef jerky. Kitty litter or sand — It may sound odd, but keeping a bag of this in your car can help add weight to the rear of your car, and if you are stuck in snow, kitty litter or sand can provide traction for your tires. Collapsible shovel — This handy tool can help move mounds of snow and "unstick" a vehicle. First-aid kit — In the event of an accident, a first-aid kit is always good to have on hand. These kits can be bought online, in general stores, and auto stores. If you put a kit together yourself, be sure to include: different sized sterile gauze pads, adhesive tape, adhesive bandages, a splint, antiseptic wipes, and elastic bandages. Flashlight — Always keep a flashlight in your car, along with some extra batteries. Flat tire tools — Changing a flat tire is not on everyone’s to-do list, but when a blowout happens, drivers should have the tools and know-how to change their tire. Keep a car jack, wrench, and spare tire in the trunk. Don’t know how to change one? Check out a YouTube tutorial. Jumper cables — If your car doesn’t want to start, cables will help. Drivers should know how to the use the cables properly and be able to “jump” their car or a fellow traveler’s. Basic tools — A general tool set can come in handy on the road. Some items in the set should include: a wrench, screwdrivers, pliers, and electrical tape. Emergency signals — Proper road flares and signs will signal for help and alert passing motorists that you are stuck on the side of the road. Safe driving should start before turning on the engine. By keeping safety gear in cars, drivers can help themselves and others. For more helpful information for winter driving, visit our Winter Driving Safety Tips page or check out our infographic on How to Winterize Your Car.